Enjoy the festive, fun-filled month of September by creating some quick and easy recipes at home! Indulge in the finger-licking recipes, specially curated for the festive season by Chef Gaurav Chadha, In-house Chef, Dr. Oetker India Pvt. Ltd. FunFoods by Dr. Oetker promises you a good time this festive season! 1 Heat saucepan (low flame), add milk, sago, cinnamon powder and vanilla essence. Keep stirring until mixture starts to boil. 2. Add sugar and mayonnaise to above mixture. Stir and cook until mixture thickens. Keep it aside to cool. 3. Add berry compote at bottom of glass or serving bowl, pour over the pudding, garnish it with apple, mint and serve. Tip: Instead of berry compote, you can also use fruit jam. 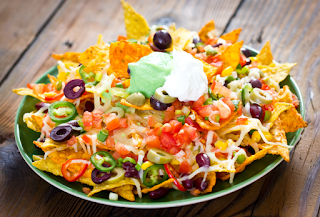 2 For Assembling: Place nachos around the plate, add above mixture in the middle, sprinkle corn. Garnish with sev and serve. 1. For stuffing-In a bowl mix coconut, peanut Butter, almonds and cashews. 2. In another bowl, mix flour, sugar, ghee & water. Knead until dough is smooth. Divide dough into 15 equal balls. 3. Roll each ball into 6inch dia. round chapatti. Place 1tbsp of stuffing in centre, pull the edges of the dough to wrap the filling & give shape of kachori. 4. Heat oil (low flame) in kadhai, fry kachori until golden brown in color. Serve. 1 Gently press the potatoes, using your hands and keep them aside. 2 For Cajun Spice Mix: In a bowl, add mix Italian herbs, red chilli powder, garlic, salt, and black pepper. Mix well. 3 In another bowl, add 1 tbsp mayonnaise, refined flour, corn flour, water and Cajun spice. Mix well until smooth mixture is formed. Add potatoes and gently mix. 4 Heat oil in a kadhai (medium flame) and deep fry above potatoes for 5 minutes or until crisp. 5 In a bowl, add spring onion, remaining mayonnaise and fried potatoes. Gently mix well and serve hot.